7th Grade Class at Oak Ridge School in Sandwich, MA. HARWICH — By noontime yesterday, workers at the U.S. Post Office in Harwich had just about finished their marathon six-hour processing job. Sixteen-year-old Dylan DeSilva stood by with a grin as he watched the last of the nearly 600 packages his group, Cape Cod Cares for the Troops, had gathered this season to send to soldiers in Iraq and Afghanistan. Among the packages was the 4,500th the group has sent overseas since it began sending them four years ago. As they had the past four Christmases, the Brewster teen and his cadre of volunteers bundled the packages — with candy, snacks, toiletries, socks and a Christmas stocking full of goodies — and mailed them in time to arrive by the holiday. Many of those who have received the boxes, and have since returned home, have come back to thank Dylan and his group for brightening their time overseas. "When you see battle-hardened soldiers crying and thanking you, it's hard to say no (when asked to help again)," said Jon Lambrou of Brewster, who was taping up the last of the boxes at the post office yesterday. The memory of those who have not returned has also been carried on through the gift package effort, said Dylan's mother, Michelle. Mark McGuire of Mashpee, whose son, Daniel, was killed in Iraq last summer, helped more than 100 volunteers pack the boxes at an event at the Trowbridge Tavern in Bourne last weekend, she said. And when the truck, which was donated for four days' use by Bresnahan Auto in Orleans, pulled into the post office at 6 a.m. yesterday, McGuire was there to help unload before he headed off to work, she said. Cynthia DesLauriers of Eastham, whose son, Mark Vecchione, was killed in Iraq in 2006, also helped over the weekend, as did several other Gold Star families, Michelle DeSilva said. Dylan, a home-schooled student from Brewster who plans on joining the Marines when he is 18, started the effort as a Boy Scout project four years ago. His commitment has turned into a year-round effort of fund-raising and mailing. His group sends to troops from around the country, choosing those whose unit commanders tell him don't get much mail. About half of them respond with a hearty thank-you, Dylan said. It cost about $6,000 in postage to send the nearly 600 12-to-15-pound packages yesterday, he said. A total of $11,000 was spent on mailing and the package contents. To support his charity, Dylan holds fund-raisers and solicits donations of both money and gift box supplies. A paintball tournament earlier this month netted about $7,000, said volunteer packager David Gilmore of Orleans. Postal workers Joyce Sullivan, Alex Joly and Chuck Hilton came in two hours early yesterday to begin processing the boxes. Dylan plans to continue sending as many boxes as he can afford and get packaged before Christmas. Sixteen year old Dylan DeSilva is the founder of Cape Cod Cares For Our Troops. Dylan has raised more than $250,000 this year in cash and goods. He has sent thousands of care packages to the troops overseas. We caught up with Dylan to talk about his Christmas Drive. With Veterans Day around the corner this is a great organization to support. LCDR Brad Volk and LCDR Andrew Carter. 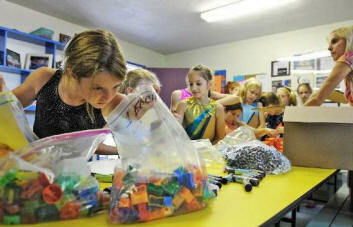 Colette Luczkow, 8, of Barnstable assembles care packages for schools in Iraq. Luczkow and other gymnasts at Cape Cod Gymnastics in Dennis helped Dylan DeSilva, who started Cape Cod Cares for Our Troops, pack the supplies. Ben, Karen, Sam, Stephen and Mark McGuire, from left, pack school supplies for students in Iraq. Mark and Karen McGuire’s son, Daniel, who was killed in Iraq Aug. 14, always wanted to help the children in Iraq. DENNIS — While Daniel McGuire was in Iraq, he took a special interest in helping Iraqi children. The 19-year-old Marine from Mashpee even wanted to return someday as a teacher. But before that was possible, he was killed Aug. 14 in the country's Anbar province. Yesterday, McGuire's family joined about 18 young gymnasts at the Cape Cod Gymnastics Center on Hockum Rock Road to fulfill at least a small part of his dream. Organized through Cape Cod Cares for Our Troops, the gymnasts packed school supplies to send to the war-torn country where McGuire died. "I think they were pretty touched by everything," Tammy Stewart, the mother of one of the gymnasts, said of the McGuire family's reaction. Stewart's daughter, 13-year-old Kimberly, said she thought the children in Iraq would be happy to receive the supplies. "It was fun and it was really good that they can have stuff for school," she said. The Dennis gymnasts plan to help with several more shipments, said Dylan DeSilva, the 15-year-old Brewster teen who started Cape Cod Cares for Our Troops nearly four years ago. DeSilva has sent packages to troops stationed in Iraq and other packages for the children affected by the war. "When Daniel McGuire was killed, one of the things that he was doing was to support all the schools and orphanages," DeSilva said. Yesterday's 125 bookbags filled with pens, paper products and other school supplies will go to schools just outside of Baghdad, he said. "They wanted to keep on doing it because that's what Daniel McGuire wanted to do while he was over there," he said of the McGuire family. 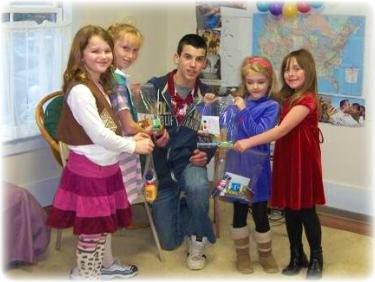 The girls in Wareham Brownie Troop 138 have met a boy that they are never going to forget. Their mothers are never going to forget him, either. Chances are every time they think about him their eyes are going to tear up. Dylan DeSilva, who lives in Brewster, came to do a special project with the Brownies May 1 at the Gleason Family YMCA. Along with the Brownies, their moms, and his own mom Michelle, 15-year-old Dylan helped prepare gift boxes to be sent to troops in Iraq. The gift boxes, intended for female troops, were filled with more then 20 items, including feminine items not available in Iraq, candies that won’t melt in 130 degree temperatures, pens, stationery, and boxes of Girl Scout cookies. For the Brownies, the gift boxes represented a project they’ve been planning since September. 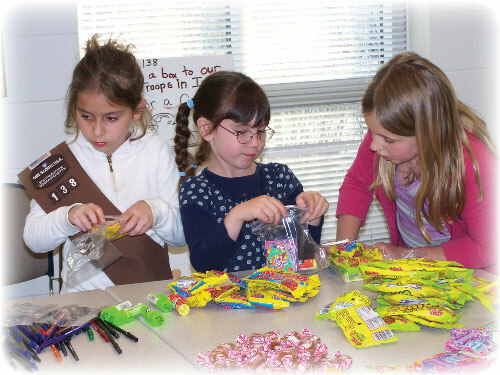 When a shipment of long-awaited Girl Scout Cookies arrived, the Brownies set their plan in motion, selling cookies to raise funds for the gift packages. "You should have seen them," Troop Leader Christine Sprague said as she glanced at the Brownies earnestly filling gift boxes. Reminiscing about the Brownies’ cookie-selling efforts she added, "People will remember them. They kept saying, if you don’t want cookies, please send cookies to our troops in Iraq." Many responded to the Brownies’ pleas. Boxes of cookies, waiting to be sent to troops, were mounded on a table at the YMCA. For Dylan, founder of Cape Cod Cares for the Troops, the boxes were among more than 3,100 that he has helped to send to Iraq’s troops. On average each box weighs 30 – 40 pounds. In addition, Cape Cod Cares also sends supplies to schools, orphanages, and medical and dental clinics in Iraq and Afghanistan. "He’s proof that one person can make a difference," Michelle said. "If (the Brownies) get one thing out of this, I hope they learn they can make a difference." Since Dylan began Cape Cod Cares for the Troops, at the age of 12, he has raised $20,000 in funds and received approximately $100,000 donated items. He’s also accumulated four, lovingly kept scrap books filled with thank you notes, letters, and pictures sent to him by grateful troops. Dylan estimates that 75 percent of those who receive packages respond with letters and/or pictures. Turning the pages of the scrapbooks, mothers fought back tears as daughters packaged gift boxes. Dylan was a member of Brewster’s Boy Scout Troop 77 when he first became involved in sending care packages to troops. The packages were sent from Otis Air Base and, quite by accident, one of the beneficiaries in Iraq was a former member of Troop 77. When he came home on leave he visited Troop 77. The stories he told and the appreciation he expressed inspired Dylan to set his project in motion. "Troops started sending names of guys who didn’t get mail. We keep getting more names. We have a waiting list now of 600 names," Dylan said. As Dylan worked with the Wareham Brownies, Sprague talked about how excited the girls have been about the project. "Look at what they are learning. Look at what they are getting. It’s the domino affect. One day someone will do something nice for them," Christine said.